Gur Rebbe reportedly bars followers from visiting Western Wall in light of stabbings; Sephardic Chief Rabbi urges Jews to visit. Israel's major leading rabbis have issued conflicting statements over the security situation on Sunday, after two Jews were killed in stabbing attacks Saturday night in Jerusalem's Old City. The Gerrer Rebbe, Grand Rabbi Yaakov Aryeh Alter, the spiritual leader of Gerrer (Gur) Hassidic Jews, has allegedly forbidden Jews from visiting the Western Wall (Kotel) for the time being due to safety considerations, a close follower stated on the haredi news forum B'Hadrei Haredim. Lithuanian leader Rabbi Chaim Kanievsky has gone one step further, barring followers from going to the Old City at all, according to haredi news website Kikar HaShabbat; so have several Hassidic rabbis, including the Vizhnitzer Rebbe. The warnings stand in stark contrast to a call from Sephardi Chief Rabbi, Rabbi Yitzhak Yosef, who urged Jews to specifically visit the holy site. "I call upon whoever has the ability to arrive on the night of Hoshanah Rabbah [Saturday night - ed.] and Simchat Torah [Sunday night - ed.] at the Western Wall, to observe the holiday and pray for the safety of the injured," Rabbi Yosef stated shortly after the first stabbing attack Saturday night. "We cannot allow a situation in which Jews will be afraid to go to the Western Wall," he continued. "The situation in which day after day Jewish blood flowed like water in Israel, [of victims] whose only sin is that they are Jews is unacceptable." "I call on all relevant parties to bring about a situation in which Jews feel safe in all parts of the Land of Israel." 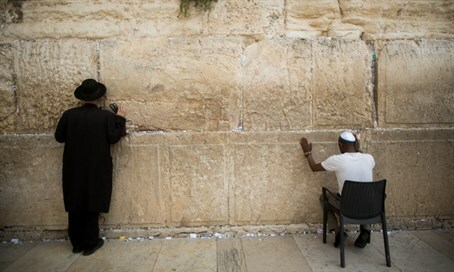 Sephardic Chief Rabbi of Jerusalem Shlomo Amar also urged Jews to visit the Kotel despite any potential risks, stating that the issue is a matter of faith. "We should not be afraid, we must trust in Hashem," Rabbi Amar said. "There should be no fear." "You have to keep coming, do not give in to them - that's what they're looking for, to turn off the festival, it hurts them when tens of thousands of Israelis visit." "Security forces have to try harder," he added, "[but] we must give them the opportunity to do so; they know how to do it." Religious Services Minister Rabbi David Azoulay (Shas) agreed. "On Hoshannah Rabbah night, it is very important to continue to go to the Western Wall and strengthen our presence there and in other holy places that symbolize our connection to Israel right now in times of trouble," he said. "With God's help we will see good news and wish a good sign for all of Israel." Kotel Rabbi Rabbi Shmuel Rabinovitch also noted the holiness of the Sukkot holiday, emphasizing the fact that Israel's prayers during the eight-day period are traditionally on behalf of the 70 nations of the world - and just as world leaders convened the UN General Assembly. Saturday night's attacks, he said, are "part of a campaign of incitement taking place recently on the subject of the Temple Mount," in which several world leaders have sided with the Palestinian Arabs. "Muslim religious leaders are trying to fan the flames to harm the delicate fabric of Jerusalem." "I call on the public to visit the Western Wall plaza and fulfill the words of Scripture, 'v'ani tefilah," he added. "Major roads leading to the Old City and Western Wall are secure and there is no danger of friction now with Arab rioters."